Our actions are a direct result of our thoughts. So what better method of attack does Satan have against God's annointed than to attack their thoughts? In her book, Meyers works to dispell the enemy's lies against God's children. She points to things such as false doctrine, lies from a friend, your belief about your background and how you were raised, and self justification (among others) as being effective weapons of the enemy. Think about it (and pardon the pun). If Satan wants you to behave a certain way, he will try to form and shape your thoughts towards any particular person, purpose or activity so that you will act out what he desires for you. 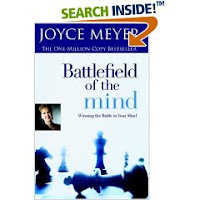 It is important - IMPERATIVE - that you fill your mind with God's truth so that you will be able to counter those attacks and win the battle for your mind. Stressed? What is at the root of it? Over active in life and committments to other people? Why? Do you feel as if you cannot accomplish anything of significance on any given day? Where does the laziness come from? Meyers shows that the root of every sin is a false thought. She encourages her reader to take the time to memorize scripture. I personally know in my head (or my heart?) that memorizing scripture and meditating on it is good for me. But I've never really understood quite why. I finally feel like I'm getting a clue. If I could recognize and identify a false statement from the enemy early on then it would not have time to root itself within me. An easy way to battle out the "bad thoughts" is by filling your mind with the "good thoughts" which, of course, is the Word of God. When you are thinking Biblically and your thoughts are God thoughts it is much harder to be irritated, stressed, annoyed and, more importantly -- swayed by every wind of doctrine. Your person will be more rooted in the Kingdom (of God). When your thoughts are aligned according to scripture you are more apt to experience peace, joy and love. It just makes sense! This book was a challenge read for me. It was good and beneficial and I think it is something that every Christian should read and be aware of. My mother in law, who passed away earlier this year, read this book last year and had told me about it. I planned to read it and discuss it with her but didn't get the chance. I wish I would have read it earlier. However, I'm quite grateful that I got my hands on a copy and sat down to read it at all! It's an amazing and thought provoking book. If you let this be a tool for truth, I think you will find that God will rock your world. And then, of course, you will never be the same.